For many people, innovation is a term that is usually connected to imaginative individuals who accomplish extraordinary things. Da Vinci, Curie, and Tesla are such names we all recognize. Indira Gandhi, Bill Gates, and Oprah come to mind in more recent times. What you may not realize is that Innovativeness is an EQ characteristic that everyone has to some degree, and it can be developed and improved upon just like any of the twenty-five characteristics that comprise the personal and social skills of your own Emotional Quotient. Start each day by reading something new—a quote, blog, or short article from a different source than you normally would. Schedule a coffee or lunch meeting with someone outside your usual circle of colleagues or friends. Ask questions to get his/her insights on various topics. Change your route to or from work, then keep your eyes open to the nuances that you encounter. Change your viewpoint at work—literally! Switch offices with someone for the day or find a workstation that offers a different vantage point to observe the environment where you spend so many waking hours each week. Get outdoors at least once a day. Walk. Breath. Sit and absorb. The sights and sounds around you will assist in bolstering your Innovativeness. If you exercise, change it up. Join a new class or ask someone to meet you at the gym. If you don’t work out, then get started. Even the simplest movement is stimulating for your brain. Purchase a magazine (yes, they still print them!) on a topic that’s not your typical genre. What do you know about Architecture? Golf? Classic cars? Remodeling? At LEADon®, we recommend that leaders begin this transformation process of improving Innovativeness themselves. Improvements in this EQ skill set can then be passed on to others in your sphere of influence. Speaking of which, how can you help your team and entire Corporate Family® become more innovative? An amazing example of offering opportunities for “novel ideas and new information” can be found at the Hallmark Company in Kansas City. This organization has created “Discovery Studios” so their employees can explore in innovative ways. Team members are encouraged to spend time in these studios throughout the year, trying different approaches or new fields that will enhance their own imaginative processes. While something on this scale may not be feasible or applicable to your Corporate Family®, as a leader you should find ways to expand the horizons of those in your sphere of influence at least once each month. For instance, can you email team members one of those quotes, blogs, or articles that you found? How about encouraging everyone to switch up their work environment for a day? Would you be willing to take your team out of the office to explore somewhere? Or why not bring someone in who could teach a class on something outside the normal scope of your vocation? 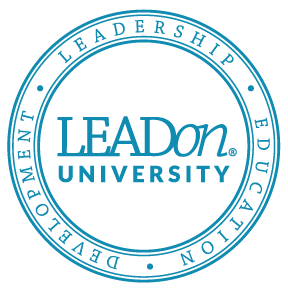 We’d also like to encourage you to take LEADon’s® online course entitled LEADing with Creativity in Your Corporate Family® where you’ll find specific strategies to incorporate as you develop the essential EQ characteristic of Innovativeness. And if you haven’t done so yet, be sure to take LEADon’s® online assessment called the Developing Emotional Competency Questionnaire® (DECQ®) so you can discover your personal strengths and weaknesses in all twenty-five characteristics of EQ. The DECQ® is also designed for teams and your entire Corporate Family® so team/organizational strengths and weaknesses in vital leadership areas can be identified (see www.LEADonUniversity.com for more details about LEADon’s® online resources). There’s no better time to begin the journey toward improving Innovativeness than now. If we can assist you in developing this or any other leadership skill, please feel free to contact us at www.LEADonUniversity.com or 858.592.0700 for more personal assistance. Photo of innovation bulbs courtesy of Shutterstock.